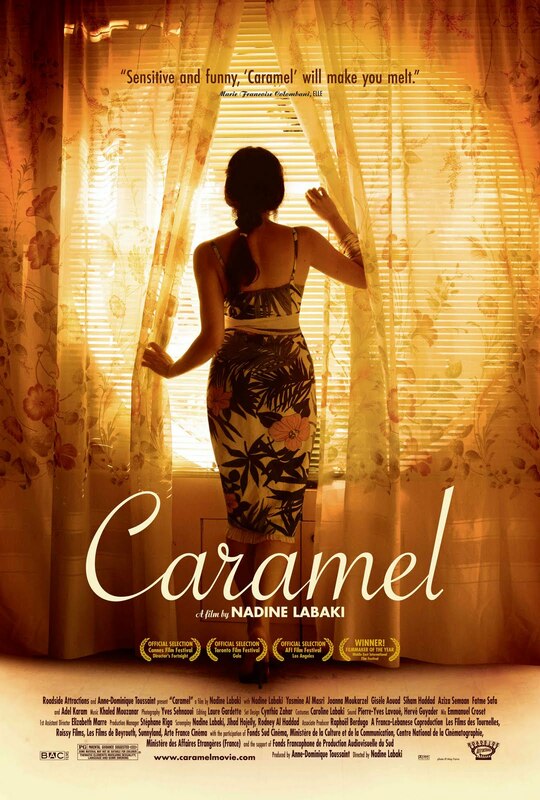 ‘Caramel’ is the first feature film of a Lebanese director Nadine Labaki which follows the lives of five Lebanese women, three of which are working in a beauty salon ‘Si Belle’ in Beirut, Lebanon. Each of the five women has her own problem: Layale (Nadine Labaki) has the affair with a married man; Nisrine, soon to be married to a man from a strict Muslim family, does not know how to tell him he will not be her first; Rima seems to be attracted to women; Jamale, a separated mother of two, fancies herself as a great actress; and, finally, Rosa, an elderly tailoress, experiences insecurities as she falls for a new salon customer. Despite being from different social and religious backgrounds, the women share close friendship, which helps them get through many life difficulties. This comic-tragic film provides a very interesting account of a Lebanon life before the Lebanon War of 2006, where Christians and Muslims live side by side and where different cultures and generations ‘overlap’ in their ideas. For example, Layale cannot seem to book a room for two (with a double bed) in any decent hotel without the documentation that she is married; and Nisrine has to work hard on her appearance to appear more conservative before a visit to her fiancé’s family. The achievement of Labaki is that political issues of the country are easily left out from the film, as she portrays the daily lives of women in Lebanon without labelling them in any way. Echoing ‘Steel Magnolias’ (1989), the film focuses on women’s problems: issues with men, insecurities regarding appearance and age etc. Therefore, it is safe to say that the film is predominantly destined for a female audience, who can instantly connect with the main characters through shared problems and worries. ‘Caramel’ also draws interesting parallels with ‘Chocolat’ (2000), with which it shares a similarly sweet title. As in ‘Chocolat’, starring Juliette Biniche, Judi Dench and Johnny Depp, the male roles are downplayed to focus on the women’s empowerment in “Caramel“. For instance, Layale’s love interest, although often implicitly referred to, is never actually fully shown on camera. Beautifully shot, with excellent camerawork, the acting in “Caramel” is very good, especially considering that the majority of the cast are non-professional actresses. ‘Caramel’ also contains a very beautiful soundtrack, some of which is sung by a Syrian singer Racha Rizk. Moreover, The title is an interesting choice, because not only it conveys the aura of sweetness and femininity – ‘Caramel’, but also has a reversed meaning or is an innuendo ala ‘Steel Magnolias’: caramel (boiled sugar, lemon juice and water) is used to aid depilation in the movie; although sweet, caramel can also be efficient, forceful and, in a way, merciless (just like the women in the film themselves). There are also some similarities here with the work of Jason Reitman (‘Thank You for Smoking’ (2005), ‘Juno’ (2007), ‘Up in the Air’ (2009)). As in these films,which depict lung cancer from excessive smoking, teenage pregnancy, and mass unemployment and adultery respectively, ‘Caramel’ resorts to the ‘dressing up’ of very serious issues to bring up funny undertones in places where usually no one is looking for them. Incidentally, Nadine Labaki’s second feature film ‘Where Do We Go Now’? (2011) follows a similar course. Some may say that the film is not ‘deep’ enough, for example, it does not explore each character to deliver an important message, and this criticism is partly true. However, this flaw also has a value, and this is what makes this film so special – as we see only the women’s momentary pleasures and sorrows in the film without going deep into their backgrounds and life circumstances, the picture somehow feels more realistic and true to life overall. Filed under Film Reviews I Tagged with Caramel, Chocolat, Comedy, Jason Reitman, Lebanese cinema, Nadine Labaki, Romance, San Sebastian Film Festival, Steel Magnolias, Where do we go now? Wasn’t aware of this previously but like the sound of it. Great review. You are very welcome. Hope you like this one.